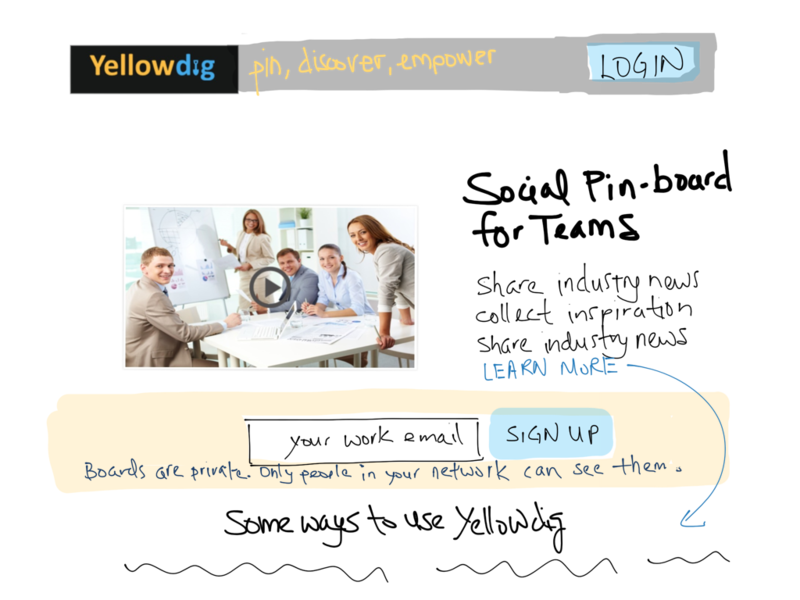 Yellowdig enables instructors and students to engage beyond the classroom. When Yellowdig made the decision to pivot from a social networking product to an education tech product, they knew they needed to update their homepage so that it spoke directly to this specific audience. 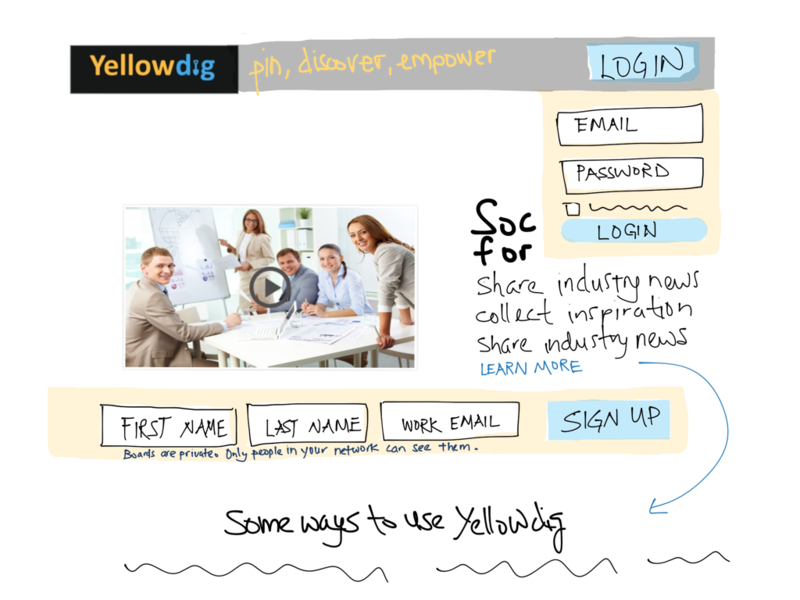 Yellowdig asked me to design the front-end and their developers would take care of the back-end. We iterated through a series of wireframes before building out with LESS and Twitter’s Bootstrap framework for faster development and responsive design. The new design included a sign-up form, product features, testimonials, call to action, and new on-boarding pages. 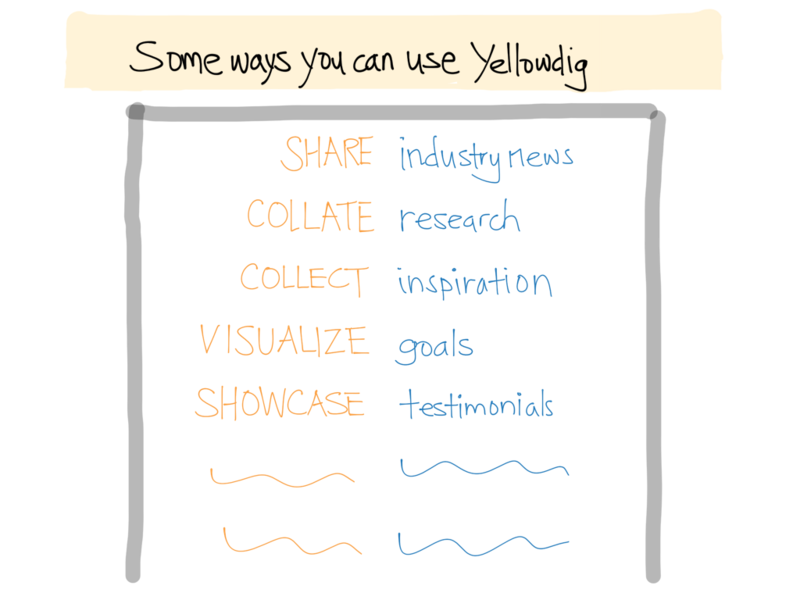 Yellowdig is a social pin board for teams that lets you share awesome stuff within your private community. The founder came to me needing a re-design to their landing page that would feature their demo video, streamline their sign-up form, and display use cases. Taking inspiration from Yellowdig’s logo and demo video, I hand-coded a landing page that matched their playful brand. I met Angela in a Starbucks while she was writing her first book. At the time, she was managing her own website via GoDaddy’s website builder and but was running into limitations. She needed a CMS to power her website so she could easily update her content, a new design that showed off her personal style, and an eCommerce component for her audio course. Angela had heard WordPress was the way to go so when she was ready, I migrated her website content into WordPress, created a child theme, used her paintings for design inspiration, and setup the eCommerce for her downloadable audio course. I wanted a website for my personal brand and envisioned a design that would reflect my environment. Sumo Swirl is a limited edition graphic T-shirt shop showcasing a mix of Pacific Rim designs with an American flair. The owner needed an online store to sell his products and a website design that reflected the brand’s playful aesthetic. I setup his shop on Big Cartel and created a custom design that reflected their unique style. The whole website was re-designed in preparation for moving the website over to Sharepoint where it would need to conform to the new KPMG style guide. The initial design template was created by a contractor. The code was then handed-off to the in-house team where I took the lead in implementing the design, updating the code to follow web standards and best practices, streamlined the CSS, and added social sharing. The previous homepage design had flash video with music that auto-played and was not viewable on mobile devices. The new homepage design allowed the client to highlight new and important content while keeping the page uncluttered and removed flash for an improved experience on the desktop and mobile. View the website: before and after. The MyLife@KPMG website is where potential college recruits learn about KPMG employees and their every day experiences in the office and in their daily activities. The original website was a flash website that had many interactive parts making it difficult for visitors to navigate. The flash website also could not be viewed on mobile devices that didn’t support flash. The new design was re-built from the ground up, designed with web standards and best practices, and a logical navigation. Dr. Jessica Chung-Levy provides orthodontic treatments with a personal touch. The doctor knew she needed an online presence so Google and new patients could find her. I designed a website that was inspired by the fun jungle mural in her patient exam room. I then moved the website to WordPress, giving her staff the ability to update content such as office hours.